Anavar By Hi-Tech Pharmaceuticals, Anabolic Agent, 180 Tabs, at SameDaySupplements.com® for lowest price. Hi Tech Pharmaceuticals Anavar is a revolutionary muscle builder designed to increase strength and size. Anavar is a synergistic formulation of potent natural steroidal anabolic agents that follow numerous metabolic pathways to accelerate muscle growth and strength. Anavar stimulates and drives adenosine triphosphat (ATP) (the biomolecule that fuels intense muscular contraction) into muscle cells, elevates and sustains nitric oxide production through arginase inhibition, increases protein synthesis, glucose uptake and deposition, and blocks the catabolic effects of cortisol on muscle tissue. Why Should I Use Hi-Tech Anavar? Hi-Tech Anavar is the gateway to accelerating and enhancing post-training recovery, hyper-activating protein synthesis, remarkably accentuating muscular endurance, developing way freaky muscular pumps, and laying the foundation for rock-hard muscle density! Hi-Tech Anavar is the perfect fusion of nutraceutical science technology with breakthrough anabolic bodybuilding compounds! Do I Need to "Load" or "Cycle" Anavar? Yes, Do NOT use for more than 4-7 weeks w/o a 8 week break between cycles. Upon completion the use of a proper Post Cycle Therapy (PCT) protocol is REQUIRED. NO EXCEPTIONS. When looking at the direct functions and traits of Hi-Tech Anavar, the most important revolve around its ability to increase nitrogen retention in the muscle, decrease SHBG and inhibit glucocorticoid hormones. The increase in nitrogen retention will promote the anabolic atmosphere as reduced levels often lead to a catabolic state. The decrease in SHBG will yield a higher level of free testosterone in the body, not only providing more of an anabolic punch but promoting a free or unbound state of all circulating anabolic hormones. In a nutshell, this makes the steroids being used more effective. As for the inhibition of glucocorticoid hormones, these are muscle wasting hormones; cortisol being the most well-known. Such hormones promote fat gain, as well as destroy lean muscle tissue. Hi-Tech Anavar contains 4-Androstenolone is also called 4 androstene-3b-ol,17-one or 4-ANDRO by many in the bodybuilding community for short. 4-Androsterone products are great stackers, and can be stacked with almost any compound. Both experimental and anecdotal evidence supports 4-Androstenolone’s ability to raise testosterone levels and improve performance. Hi-Tech Anavar also incorporates 1-Androstenolone that has a unique structure which makes it favorable to many people who want to balance their hormones. This steroid hormone has a double bond at the 1st molecule, which many believe make it more resistant to metabolic clearing. This 1-ene structure also helps resist conversion to many hormones that are not considered optimal for men like estrogen and dihydrotestosterone metabolites. Thus with 1-Andro you get a prohormone that may enhance your androgen to estrogen ratio, without adding in additional metabolites that you may not want in your system. This prohormone is great for adding in a dry prohormone to a cycle or used alone to offset the environmental estrogens in your diet. Lastly, Hi-Tech Anavar uses Epiandrosterone, which is an endogenous steroid hormone found in Hi-Tech Anavar with an androgenic activity. Epiandrosterone and is produced in the body as a metabolite of testosterone. Epiandrosterone is legal because it has been found naturally occurring and is excreted in urine as a normal part of human metabolism. Epiandrosterone differs from testosterone in another way as well. Being a 5alpha-reduced androgen (a DHT derivative) it simply cannot aromatize to estrogens. This makes Epiandrosterone unique compared to other now banned prohormones — all of which can either aromatize directly, convert to a product that aromatizes, or both. Why is Anavar Better Than Other Prohormones? One thing that most people are not aware of is Anavar Hi-Tech's astonishing ability to stimulate creatine phosphate synthesis in the muscle cell. When this happens your body starts cranking out tons of ATP (adenosine tri-phosphate) the actual chemical you need for muscular energy and ATP is vital! And it's most vital for a bodybuilder, because low ATP levels which always occur after a workout, dramatically limit protein synthesis. However, this rarely happened to anyone takingAnavar Hi-Tech because their muscle cells are cranking out so much creatine phosphate, and thus ATP! And this is a motivation reason chemists at Hi-Tech made Anavar ,to stimulate creatine phosphate synthesis, not creatine monhydrate synthesis! Your next question is only logical... Then why do people still get significant results from creatine monohydrate? Simply because some of the creatine monohydrate does get converted by the body to Creatine Phosphate, also known as phosphocreatine (PCr), but not nearly as much as it should. Phosphocreatine (PCr), which is a phosphorylated creatine molecule that provides a reserve of chemical energy in the form of high-energy phosphate bonds that can be rapidly mobilized from PCr. Since creatine is the rate-limiting compound in the formation of PCr, a sufficient supply of creatine is crucial to maximize the work performance capability of the phosphagen system, which directly correlates to the ability to enhance muscle and strength. That is why many atletes stack Hi-Tech's new Phosphagen Creatine supplement with Anavar. Anavar Hi-Tech ensures an uninterrupted supply of creatine to 1) enhance the anabolic effect of greater muscle cell volumization, including through increased protein synthesis, and 2) heighten and more rapidly mobilize concentrations of PCr muscle fuel to facilitate the rapid and sustained transfer of high-energy phosphate within the phosphagen system for ATP resynthesis. Thus, the bodybuilder who wisely chooses Anavar Hi-Tech will have the extra amount of muscle fuel available to complete the additional reps required to pull the trigger for muscles to grow. Anavar Hi-Tech has an approximate 8 hour half-life. Thus, a moderate dose taken in the morning is largely out of the system by night, yet supplies reasonable levels of androgen during the day and early evening. Anavar Hi-Tech also contains efficacious dosages of several key anabolic compounds, including three of the most potent anabolic compounds ever researched by Russian scientist V.N. Syrov and his team of colleagues, who are responsible for many of the greatest advances in herbal-based nutraceutical sports nutrition. These interesting compounds are 25R, spirostan-5a-diol-6-one-3-one (Ecdybolin)(which demonstrates a 33:1 anabolic to androgenic ratio), the 6-keto derivative of diosgenin (6-keto-diosgenin), and 20- hydroxyecdysone decanoate isolated from Rhaponticum carthamoides extract. These three compounds are structurally and biochemically close cousins. They have been shown to significantly enhance protein synthesis void of any androgenic pathway activity, which makes them exceptionally desirable to bodybuilders and strength athletes. In fact, athletes from Russia and other Eastern Bloc countries have been incorporating these powerful compounds into their arsenal of anabolic agents for nearly 40 years. For additional anabolic thrust, and also for a pronounced boost in anti-proteolytic (protein-sparing) activity, Anavar Hi-Tech incorporates several esters of Androstenolone and , one of the most powerful legal pro hormones available. Androstenolone and Epiandrosterone are multi-functional steroids that have been implicated in a broad range of biological effects in humans. Recent studies demonstrated that these compounds act genomically through the androgen receptor (AR) in addition to its well-known effects on cell surface receptors. The Androgen binding is what has given Hi-Tech Anavar its stellar reputation for beneficial muscle gains, lack of side effects, and incredible strength gains. In addition to partitioning Androstenolone and its metabolites into compounds with (Androstenolone, Adione, Adiol) and without (DHEA-S, 7α-OH-DHEA, 7β-OH-DHEA, and 7-oxo-DHEA) androgenic activity, the researchers at Hi-Tech have improve upon our understanding of the intracellular processes mediating the genomic effects of Androstenolone through Androgen Receptors. Hi-Tech Anavar ability to selectively bind to Androgen Receptors is one reasons athletes see gains so quickly and the gains are not lost upon discontinuing the product. Anavar Hi-Tech also incorporates an 3 pronged unconventional delivery system called "controlled-release bead technology." To put it simply, this new system allows the special Hormones and compounds in Anavar Hi-Tech to remain intact and protected while in the stomach. Then, when the tablet is in the "safer" part of the gut (upper intestine), the nutrients begin to be released into the system and continue to be released steadily over a two to eight-hour period. With this type of controlled-release delivery, testosterone levels could be elevated for up to eight hours by a single dose of Anavar Hi-Tech. 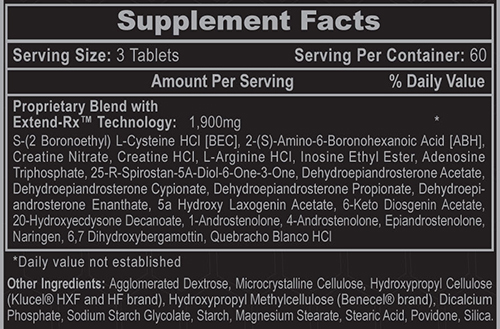 Current tablets or capsules bioavailability of Androstenolone and Androsterone is approximately a mere 1.5%-4%. This means that a 150 mg capsule of Androstenolone would only deliver 2.25-6mg biologically active milligrams, which is less than your body naturally produces daily. Conversely, a single dose of 150 mg Androstenolone in Anavar Hi-Tech delivers between 30-42 biologically active milligrams. The differential is colossal. Androstenolone esters, which converts to Androstenedione then to Testosterone, exhibit strength and lean mass gains while Androstenolone esters are extremely rare prohormones that converts slightly to DHT — which exhibits increased aggressiveness, improves libido, promotes a positive energy balance and has a known hardening effect. Hi-Tech researchers were the first to begin to use these potent compounds — long before the recent steroid laws were revamped to add almost every prohormone known to be a controlled substance. Therefore, our technology to getting the powerful prohormones into the bloodstream by far surpasses any other company in the industry. We have worked on different technologies for over a decade while everyone else enjoyed the fruits of selling illegal compounds. Now that Hi-Tech is on a level playing field with our competitors there is no comparison in the effects achieved by products like Anavar Hi-Tech when compared to people who just are trying to put any product out to have a product in the marketplace without any concern for its efficacy. No, we do not suggest Anavar to females. If you are looking to take a hardening product we recommend Laxogenin. What's In Hi-Tech Pharmaceuticals Anavar? Take 3 tablets of Hi-Tech Anavar in the morning and 3 tablets of Anavar in the afternoon or evening. Do not exceed recommended dosage as Anavar is a potent anabolic agent. I'll start taking it later, I'll tell you the results. After about 2 weeks of taking this my strength increased quite a lot. I would suggest to buy 2 bottles as after taking one it felt like I just started to get maximum benefits. Next time I am planning on a 2 month cycle. Very effective and efficient for gaining muscle mass. It is already possible to notice after one month of use. One of the strongest products for bulking or cutting and without any kind of side effect. Got bigger Review by Josh O.
Thumbs up! Review by Tyler M.
We have a large selection of in-stock Hi-Tech Pharmaceuticals products including Bulking and Cutting Anabolic Precursors items and others for the lowest prices at SameDaySupplements.com® It's always easy to shop for Anavar By Hi-Tech Pharmaceuticals, Anabolic Agent, 180 Tabs, at SameDaySupplements.com® because you can browse by reviews, brand, prices or search for specific ingredients using our search tool. In-stock orders placed before 3pm EST ship out the same day to USA, Brazil, United Kingdom, Canada, Germany, Australia, Japan, India, France and worldwide at the cheapest prices online.